Check out the updated version of this post by clicking here! I promised in my last post that I would post some information about the Animal Reports we just completed so...here goes! Our reports took about two weeks to complete and we had them on display for our student-led conference night. The kids were so excited to share with their parents there wonderful reports so I thought I would share with you! While shopping I found some amazing ZooPals plates made by Hefty, they came in a pack of 20 and were super cheap. There were 10 different animals in each pack and there were a TON of animals to choose from. 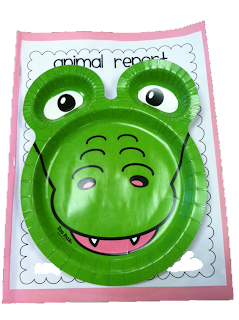 I picked the plates that I was able to find easy-read nonfiction books for and made a list on the board so the kids could choose which animal they wanted. I had them write me a letter to tell me their top three choices. I put the kids in groups of 2 and we got busy. 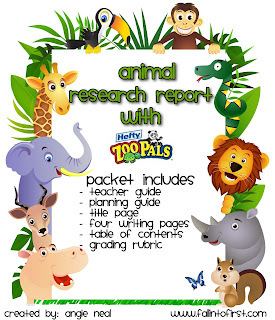 I have provided step-by-step instructions and all black lines in my Animal Research Report Packet on TpT. Here is a couple pictures of what one students report looked like.